Promotional Logo Sun Ray Sunglasses – Electric are great promo items for making outdoor events and activities great fun. These custom sunglasses are having a total dimension of 6" H X 0.5" W and are presented in exciting dual-tone color options. This classic folding eyewear is coming with UV400 protective lenses that guarantee a cool experience even in the hottest times of the year. Individually packed in gift boxes, these custom plastic sunglasses are offering 0.38" H x 1.50" W imprint area. Order these custom Oahu sunglasses quickly to gain free design, free online proofs and fastest turnaround time facilities. 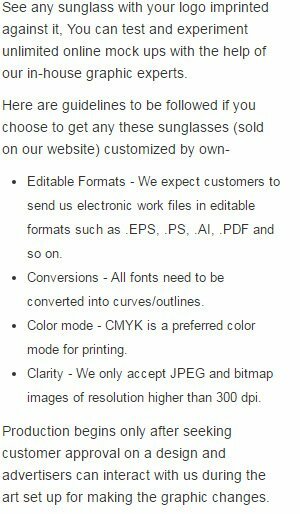 Request a quote to know savings that you can pocket on bulk ordering these Promotional Logo Sun Ray Sunglasses - Electric.